First time mommy-hood can be very overwhelming! It’s a new path in life and there are so many decisions to make! Everyone wants you to take their advice, and all you want to do is snuggle with your new baby! As a Crunchy Mom, there are so many things I know now, that I didn’t know or understand when my baby girl was born. If I could do them over with her, I most certainly would! I am absolutely taking notes for when baby number two comes along! 1. Skin to skin from the start! I would make sure that I had an appropriate shirt for skin to skin from the very first minute. I feel that I missed out on valuable bonding because I didn’t do very much skin to skin from the start. 2. Nurse around the clock! I didn’t understand in the beginning that it was okay for baby to basically nurse around the clock. Looking back, my heart is sad at all the time I wasted not nursing, cuddling and softly bonding with my baby girl. I’m so sad that we didn’t breastfeed past 6 weeks because my “supply was low.” If I had nursed more from the beginning, maybe we would have succeeded and still be breastfeeding today! 3. Baby Wear right away! Another chance at bonding that I feel I missed in the very beginning was baby wearing. My baby was probably at least a month old before I started wearing her, and even then, it wasn’t very often. I want to baby wear my next one from the very first day! 4. Take better care of Mom during pregnancy! While I knew I should eat better during my pregnancy, I did not make good food choices. Exercise was not a priority either, as I was working variable hours and would come home exhausted. I would want to eat more fresh fruits and vegetables and lean meats during a second pregnancy. I would also want to walk at least every other day. I believe that this would have helped me lose the baby weight, too! 5. Use natural products! Before I knew better, I thought all the ‘traditional’ baby products were perfectly fine to use on my sweet and innocent newborn. That is, until I started to do some research. Next time, we will use natural baby products from the beginning! My baby is worth their cost! 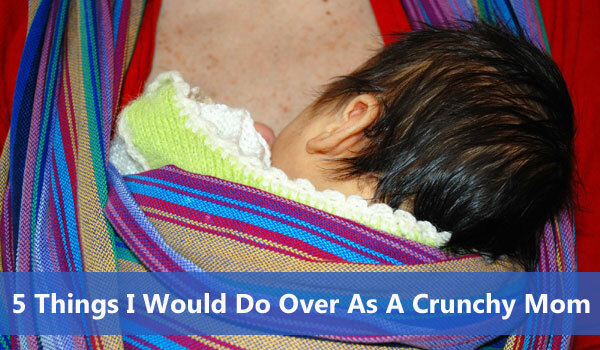 As a first time mom, there are many, many, more things that I would want to “do over.” As a Crunchy Mom, there are many things that I have now researched, and will do very differently next time around. I choose not to beat myself up, though, because “when we know better, we do better.” From here on out, my baby girl will have the benefit of a Crunchy Mom, and when the next baby comes along, they will have the benefit from the start! Be kind to yourself, new Mama! You just created a new life! What would you want to do over from your journey of mommy-hood?